Interests:American Civil War Reenacting & Living History; collecting WWI and American Civil War militaria and relics; reading; family. He arrived at the Front around the 2nd April 1918, and went to Kemmel Shelters Camp, and helped to resist the Germans there. He then moved with the regiment to the front line near Rheims. Following this he was caught up in the German offensive there, and was taken prisoner on the 27th May 1918. Any reference to him, or A company over that period would be very much appreciated. Also if you can provide any specifics on Kemmel shelters camp, or the period between April 2nd and May 27th I would be most grateful. He was also captured on the 27th, in a redoubt just adjacent to my Great Grandfather. I believe that he had previously been in the 8th KOYLI when he won his MM. His details then were, 18605 Sergeant-Major F.A Marsden. I hope you are well ... don't know if you remember me ... seems like it's been a long while; you and I conversed last year on the forum and in email about my grandfather, Frank Marsden. While doing a search this evening, I couldn't help but see your recent post on the Forum from January when you were asking Andy ("Max") about anything he could find in the KOYLI Regimental History about Frank. Could I trouble you to pass along anything he was able to find for you? Thanks in advance. PS: tried PM'ing you but your Inbox is full. I know this is now a bit of an old post but I've only just seen it. I emailed you all the new stuff I had gathered about our relatives. I included a few pics from when I went to the place they were caught. In that lot was the stuff Andy sent me (hope this was OK with you Andy ) so hopefully you got it. If not let me know. I have cleaned out my inbox as well so you should be able to get through. Sorry about that. Interests:family history grandads survival and his part in the great war.A.Homer another survivor. am reserching Arthur Ripley from Leeds i think was an officer in the 12 bn K.O.Y.L.I. Would it be possible to do a quick search and confirm same thanks. Hopefully you will see this post Andy. Is there a record of 2nd Lt Albert Jenkinson in the 2/4th battn from 1914 right through to the end? I have most of this gentlemens artifacts. I have just been reading through your pages of help - this site overwhelms me with its comradeship. Many thanks for the mention of the book "Unceasing War" written by Malcolm Johnson, this should really help me out with own personal research on the 6th KOYLIs – two of my great-uncles fell at the Somme. If anyone else has need any need of information about the 6th KOYLIs, or would like to pool their information, please get in touch. Well done for all your help that you have given. This is my fort post to the forum, hope I am doing it right. I realise this thread is quite old though I see the last posting was Sept 08. 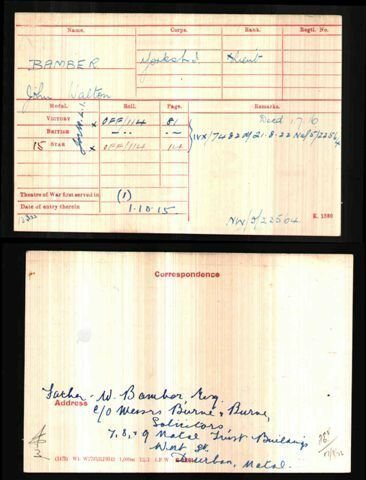 I am researching my g-g-uncle Lt. John W. Bamber, 10th Bn KOYLI, died July 1, 1916 and is buried in the Gordon Dump Cemetery. I was pleased to see him mentioned in your reply in post #59 as accompanying the battalion to France. Is he mentioned again at all, especially any information about him on the day he died, July 1, 1916? Welcome to the Forum.If you havent got his MIC here it is off ancestry with his dads addy on it as NEXT OF kIN. Hi Ady, No, I did not have this - many thanks for the reply! I do have his service record from the NA, as well as the 10th KOYLI Diary for June and July 1916 but there is not much there. Additional information: Son of Jane Livingstone Oatt Spark, and the late Rev. Alexander Spark. Born at Kirkwall. Hello , you may be interested to know that his name appears on the Church War Memorial here in Glasgow where his brother was the minister. Can you please look up 6th Bn Koyli for the 9th April 1917 Arras? Trying to work out where LCpl Charles Gittins was when he died.6th Bn was part of 14th Div 43rd Brgde.Think they went over top at about 7.30am. hope you dont mind me jumping in here but have been researching my grandfather who was with the 6th on these dates and i had this info to hand !. below is an extract from a book called Unceasing war by malcolm johnson,its a history of the 6th in the great war, long out of print now i'm afraid. The 6th battalion was part of the british 14th division(light) and on the 7th april 1917 moved into the caves and tunnels at Ronville ready for the attack on the 9th april. The tunnels would emerge only 1000 yards from the german lines, at ,at 7.35am on the 9th april in snowy conditions the 6th battalion went over the top and towards their first objective,Pine lane trench,the Germans were taken by surprise,with a tank breaking down the barbed wire,pine lane trench was captured by 8am. The next objective was a strongpoint know as Fir Alley Redoubt,again with tank support this fell quickly and by 8.40am the final objective for the 6th battalion,Telegraph hill trenches were also taken. that evening the 6th battalion were relieved and moved away to the old british lines at Beaurains. Interests:WW1 & WW2 with particular interest in the 3 Battles of the Scarpe and Arras 1918. To add to what John has given you, I have a lot of material from the attacks on the 9th April, if you interested send a PM and I will see what might be useful for you - you as well John. might be hard to pin down wherever LCpl Charles Gittins actually died but the general area is pretty clear. This link might also interest you for the 9th April. Thanks to John & Jim for speedy reply this is just what I'm after. LCpl Gittins is not related to me but I bought a postcard off ebay the other day showing a wooden cross marking his grave along with a Pte Wilson. Both being from Sheffield like myself I decided to find out where they were 9.04.1917. I haven't looked at the Arras period I have been concentrating on Third Ypres so this has been an absorbing project. Hi Jim I can't seem to send a PM any suggestions - I am new to this!! Additional information: Son of Richard and Lily Gittins, of 12, Court, 3, House, Eyre Lane, Sheffield. Grave/Memorial Reference: III. G. 8. Could you possibly look and see if their is any mention of L/Cpl Allan Hargill, he died in December 1915. I have a copy of this book - but sorry no mention of L/Cpl Allan Hargill. I am making a study about the last days of WWI between Audenarde and Tournai area in Belgium. I noticed the 15th KOYLI got involved. In this way I would be grateful if you could share some info of 8/9/10 and 11 November 1918. I’m looking for any info on my Gt Grandfather, Fred Cotton. He was demobbed at the end of the war but got a Military medal, gazetted in 1919 as Sjt F. (Fred not Frederick) Cotton 38611 2nd Battalion KOYLI. I don’t think he joined in 2nd Battalion as he was given 1915 Star with date May 15. We have an image of him as a L/Cpl in hospital blues (not sure of the location) but he had a medal ribbon on his blues too. No sign of visible injury, so assume he was gassed at some point. any help regards his MM or anything else would be greatly appreciated. Welcome to the forum, it would be best if you start a new thread in Soldiers section, rather than tag into a very old thread. If you can add as much information as possible, hopefully you will get some answers.